No assignments, at least today. This week has been an assignment sh**storm with all the SVXY I now own. Still looking for us to go back into contango on the VIX futures next week with a lot of help from the expiring Feb contract on Wednesday. If volatility calms a bit next week a flat curve/slight contango should be in place by Thursday. Then maybe we can start looking at laddering in some SVXY covered calls. It has been a hell of a week and my mark to market has taken a big hit like many of you as well. But we will make it all back. No expirations today. 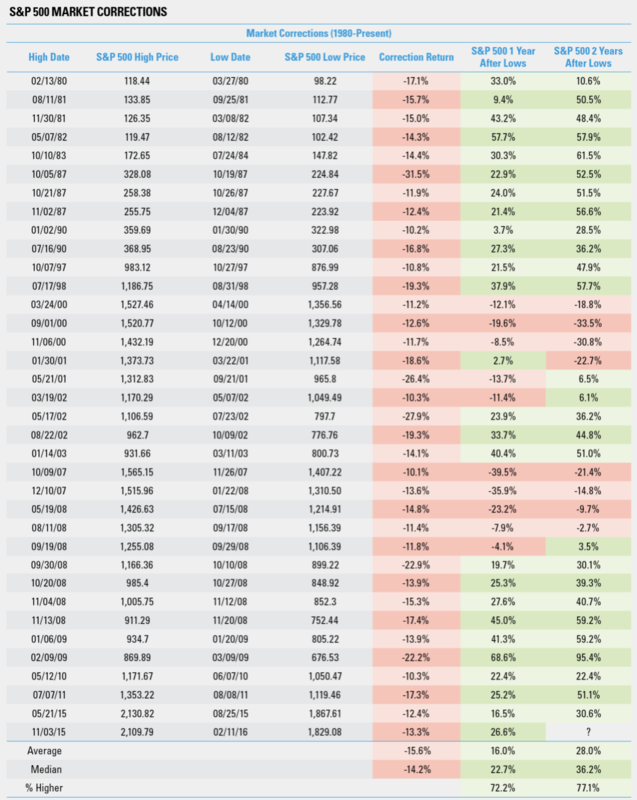 Here are all 36 10% corrections since 1980. Note: a year after the lows, stocks are up a median of 23% and two years later up 36%. Borrowed this idea from TastyTrade. Sold $SNAP Mar 16 20 calls @ 1.20 with the stock at 18.96. IV rank is high at 74. I’m looking at the decreasing volume and slowed momentum after earnings this week. Would seem to need another big catalyst to push it back up to the highs from Wed. Will be watching closely. Planning to take it off for .60 (50% profit). SPX hitting the 200 day sma, that’s far enough Mr. Market!